A new GeeXLab is available, this time for Windows 64-bit and Linux 64-bit! * (2019.01.06) fixed a bug in gh_imgui.combo_box_create(): label was not assigned. all GeeXLab modules in scripts loaded via the main XML file.
! (2019.01.05) [Windows] updated Python 3 plugin with latest Python 3.7.2.
! (2019.01.04) [Windows / Linux] updated Bullet3 plugin with latest version 2.88. * (2019.01.03) fixed a bug in gh_utils.extract_dir_from_filename() on Linux. * (2019.01.03) fixed a bug in the window event loop on Linux.
! (2018.12.31) [Linux] ImageMagick plugin updated with SDK version 7.0.8.22.
! (2018.12.31) [Windows] ImageMagick plugin updated with SDK version 7.0.7.39. The branch 7.0.8.20+ of ImageMagick crashes on Windows (an issue with aligned memory). support on Windows and Linux. A new lib (gh_cuda) has been added in Lua and Python. creation failed on Intel GPUs. + (2018.12.28) added new PhysX4 plugin on Linux based on PhysX SDK 4.0. + (2018.12.28) [Linux] added Python 3 plugin (linked with -lpython3.6m). compilation, ... ). This version of GeeXLab has been compiled on Linut Mint 19.1 64-bit.
! (2018.12.28) [Windows / Linux] FFmpeg plugin updated with latest FFmpeg 4.1.
! (2018.12.28) [Windows] ImageMagick plugin updated with SDK version 7.0.8.21.
! (2018.12.27) [Linux] ImageMagick plugin updated with SDK version 7.0.8.20. + (2018.12.22) added new PhysX4 plugin on Windows based on PhysX SDK 4.0. A new lib is available in Lua and Python: gh_physx4. + (2018.12.22) added draw_primitives_instancing() to gh_renderer lib (lua, python). + (2018.12.22) added set_vertex_attrib_instancing_divisor() to gh_vb lib (lua, python). A new update of GeeXLab is ready for Windows 64-bit and Linux 64-bit. (and in output box on Windows platform). + (2019.01.08) added input_text() to gh_imgui module in Python. + (2019.01.07) added vk_gpu_get_nvidia_driver_version() to gh_renderer. "rayteak", "fromhue", "cherry" and "dark2" (see gh_imgui.set_style_colors()). Another day, another release! The previous GeeXLab 0.27.1.0 has been badly compiled. So many demos didn't work with this version. GeeXLab 0.27.2.0 adds one important thing to Python: the support of the GIL (Global Interpreter Lock). So Python scripts launched in a separate system thread work correctly. * (2019.01.09) fixed ImGui input support for Linux (for use with gh_imgui.input_text()). that are readable and writable from any thread / script (gh_utils.global_array_xxx()). 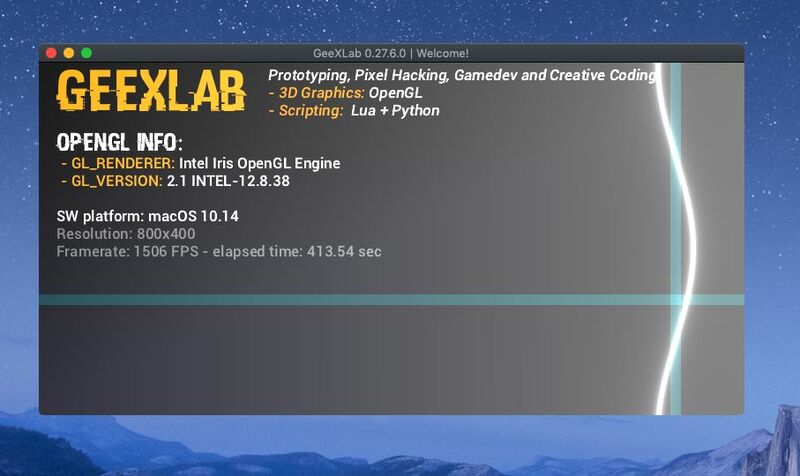 A new version of GeeXLab for Linux is available. can run on Linux with older versions of GLIBC. A new update of GeeXLab for Windows 64-bit and Linux 64-bit is available. ImGui has been updated to latest version 1.67 release and new tabs functions have been added. A new function to set the number of solver iterations per actor has been added to PhysX 3 and PhysX 4 plugins. gh_physx4 libraries (lua and python). and tab_item_set_closed() to gh_imgui lib (lua, python).
! (2019.01.15) updated with ImGui 1.67 final release. A new update of GeeXLab for Windows 64-bit and Linux 64-bit is available. ImGui has been updated to latest version 1.68 release and new functions have been added to gh_imgui. Few missing functions have been added to the Python plugin. Thick / wide lines support has been improved (mesh ribbon, widelines in gh_polyline).
! (2019.02.25) [Linux] linked with GLIBC 2.27.
! (2019.02.24) improved mesh ribbon and thick/wide lines support. + (2019.02.23) added ribbon_add_point_v2() to gh_mesh. bound render target (OpenGL only).
! (2019.02.20) [Assimp plugin / Windows] updated with latest ASSIMP SDK.
! (2019.02.20) [Windows] background message sets window to black.
! (2019.02.19) updated with ImGui 1.68 final release. separator(), spacing() and url() to gh_imgui lib (lua, python). A new update of GeeXLab for Windows 64-bit and Linux 64-bit is available. ImGui has been updated to the latest version 1.69 and few new functions haven been added as well as a new built-in color style. The PhysX 4 plugin has been updated with the latest PhysX SDK 4.1. The Vulkan plugin has been fixed and improved.
! (2019.04.05) [ImageMagick plugin on Linux] updated with latest SDK 7.0.8-37.
! (2019.04.05) [PhysX plugin on Linux] updated with latest PhysX SDK 4.1. + (2019.04.03) added new color style to imgui lib: "corporate_grey".
! (2019.04.02) [Assimp plugin] updated with latest SDK 5.0.0 RC1 (Windows and Linux).
! (2019.04.01) fixed minor bug in gh_imgui.input_text().
! (2019.03.27) [ImageMagick plugin on Windows] updated with latest SDK 7.0.8-35. + (2019.03.27) added set_keyboard_key_enabled_state() to gh_utils. + (2019.03.26) added vk_set_command_buffer_swapchain_buffer_index() to gh_render_target for Vulkan.
! (2019.03.21) [PhysX plugin on Windows] updated with latest PhysX SDK 4.1.
the creation of a device and several other minor bugs.
! (2019.03.13) updated SQLite 3.27.2. + (2019.03.13) added select_draw_list() to gh_imgui lib (lua, python).
! (2019.03.13) updated with ImGui 1.69. + (2019.03.09) added get_gpu_memory_dedicated_vidmem_kb_nv() to gh_renderer. + (2019.03.08) added set_line_width() and set_line_stipple() to gh_renderer. * (2019.03.08) Python plugin - fixed bug gh_renderer.solid(). of gh_mesh lib (lua, python). + (2019.03.06) added is_extension_supported() to gh_model lib (lua, python). * (2019.02.28) fixed return value of gh_imgui.is_mouse_clicked(). A new update of GeeXLab for Windows 64-bit, Linux 64-bit and macOS is available. + (2019.04.17) [macOS] added PhysX 4.1 plugin. + (2019.04.17) [macOS] added Python 3 plugin (Python 3.7.3). + (2019.04.16) added set_vertices_color_v2() to gh_polyline. + (2019.04.16) added circle_create_v2() to gh_utils. instancing_get_scale() and instancing_get_color() to gh_mesh.
! (2019.04.13) [Windows] updated OpenVR plugin with latest OpenVR SDK 1.2.10.
! (2019.04.13) [Python 3.7 plugin] updated with Python 3.7.3 on Windows. * (2019.04.12) fixed a minor bug in gh_imgui.checkbox(). + (2019.04.12) added list_box_begin() and list_box_end() to gh_imgui lib. layered style (for transparent windows).
! (2019.04.12) gh_font.text_2d(): x and y parameters are now float.